Following the Lehner/Gauri work in the early ‘80s, I tried unsuccessfully to initiate a dialogue with them to discuss their results as they related to the age of the Sphinx. Attempts to interest or involve other independent geologists with expertise in Egypt or desert weathering also failed. Eventually, however, in 1989, a contact was made with Dr. Robert M. Schoch, a stratigrapher and paleontologist at Boston University. Though deeply skeptical, Schoch was intrigued by the argument and the evidence but could not give an opinion until he had examined the site personally. Shoestring financing was obtained and Schoch traveled to Egypt with me on an unofficial survey. Though we could not get permission to enter the Sphinx enclosure to study weathering details close-up, the weathering on the Sphinx is so extreme and clear-cut that even from the edges of the enclosure Schoch was able to convince himself that the weathering was due to water, as the theory postulated. Only the Sphinx, its enclosure walls (and several other structures related to the Sphinx architecturally or stylistically, such as the Mortuary Temple at the end of the Sphinx Causeway) exhibited these telltale marks of water weathering. Everything else dating from dynastic Egypt had been weathered by wind and sand. The typically wind-and-sand weathered structures scattered around the area were cut from the same layers of bedrock as the Sphinx itself, and therefore could not date from the same period, as Egyptologists believed. The Sphinx and Valley temples must have been built in two stages to account for the weathered massive limestone coreblocks behind the granite ashlars. Though provisionally satisfied with the theory, Schoch could not present it to the geological world without having had direct, officially sanctioned access to the Sphinx and its enclosure, and he needed to carry out a far more detailed examination of the many facets of the theory, just to satisfy himself. Acquiring permission to carry out the necessary research proved to be a delicate and time-consuming process (details of which will be in my forthcoming book on the Sphinx). But with the permissions finally in place, the research team returned to Egypt. It included - on an unofficial basis - two other geologists, an oceanographer and Thomas L. Dobecki, a highly respected geophysicist, to carry out seismic investigations in the hope of uncovering further evidence of the earlier civilization responsible for the Sphinx. Now, able to study the Sphinx close-up, on the basis of the weathering profiles on the Sphinx and even more telling, its enclosure wall, we were able to determine with some precision the specifics of the water weathering. It had not been high floodwaters as I had originally surmised. This was a notion I’d never been comfortable with. I could not imagine weather conditions that would flood not only the Sphinx, low on the floodplain, but the Mortuary temple 100 feet higher up on the plateau. The geological literature I consulted described much wetter conditions prevailing in Egypt in the distant past - long periods of heavy rain and immense floods; therefore, I assumed the floods had to be responsible for the weathering. But now inside the Sphinx enclosure, it was clear to the geologists that it had been those heavy rains that had caused the weathering, not floodwaters. Dobecki’s seismographs (too complex and technical to explain in brief here) produced subsurface weathering profiles that corroborated our earlier dating for the Sphinx. More dramatically, the seismographs revealed several underground cavities or voids in the immediate Sphinx area. Their regular shapes and/or their strategic placing made it difficult to ascribe these to naturally occurring geological voids (called karst features). Most interesting was a large rectangular space some 12 x 15 meters in area, and 5 meters below the surface, between the paws of the Sphinx. Provocative in its own right, this buried chamber provoked particular excitement in certain New Age circles. The famous American psychic, Edgar Cayce, had predicted in trance that the Hall of Records, containing the history of the lost continent of Atlantis would be found between the paws of the Sphinx. Needless to say, this and other trance-inspired readings on ancient Egypt had made little impression on academic Egyptologists. But the seismographs do not operate in trance, and here was a substantial, apparently artificial void or chamber under the paws of the Sphinx - exactly as Cayce predicted. What does the chamber contain? We still don’t know. As this is written, our request for permission to carry our researches through the next stage is on hold. With the geophysical results in, and our official examination of the area complete, Schoch was prepared to support the theory unconditionally. While it was still impossible to provide a definitive date for the original carving of the Sphinx, the fact - indisputable in Schoch’s eyes - that the deep weathering was precipitation-induced could only mean the Sphinx was much older than it was supposed to be. Extensive paleoclimatological studies (paleoclimatology is the study of ancient weather patterns) agreed that Egypt only became desert around 10,000 B.C. Prior to 15,000 B.C., it and the rest of northern Africa was fertile savannah, something like modern-day Kenya. But coincident with the breakup of the last Ice Age, Egypt experienced a long, unsettled period of heavy rains. When the worst of the rains stopped around 10,000 B.C., Egypt had become desert, and it has been desert ever since-though enjoying several extended periods of rainfall when areas that are now barren desert were green. Between 10,000 and 4000 B.C. Egypt grew increasingly arid. By 4000 B.C., Egypt had become the desert of today. Around an inch of rain a year falls in the Giza area. Under no circumstances could this produce the weathering we observe on the Sphinx. Taking the most conservative estimate permitted by the combined data, Schoch put the minimum date for the carving of the Sphinx between 5000 and 7000 B.C., but acknowledged that this was a minimum. For a variety of complex art-historical and archaeological reasons, I felt that the date was more likely earlier. The known Neolithic cultures flourishing in the 5000-7000 B.C. range did not seem to have the kind of technology needed to carve the Sphinx and erect the amazing temples in front of it. The notion of an Atlantean civilization is of course derided and ignored by the modern academic establishment. But while derision may silence and suppress good evidence, it does nothing to negate it. There is mounting evidence from a number of fields to support the widespread ancient belief that there had indeed been such a lost, high civilization-wherever it may have been located geographically. The evidence also supports the ancient contention that this civilization vanished quickly under catastrophic conditions. The extreme, unsettled weather patterns following the breakup of the last Ice Age are a matter of record. There are still more pieces missing to this vast puzzle than there are in place, but it is now possible to get at least a rough and tentative idea of what the finished picture must look like. I think it extremely likely that sooner or later it will become apparent that the Sphinx is a part of that puzzle and that it was carved at least ten thousand years ago. At the least, the Sphinx cannot be made to fit into the accepted historical paradigm. On successive investigations in Egypt with Schoch, we were able to support the theory from several other angles. The mudbrick tombs of the earliest kings of dynastic Egypt are found in Saqqara, ten miles to the south of Giza. The mud bricks of these tombs are still in recognizable and stable condition. 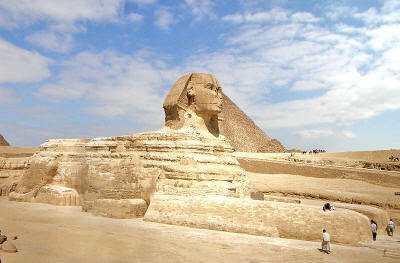 The tombs were erected around 3000 B.C., some five hundred years before the Sphinx was supposedly carved by Chephren. If, as some Egyptologists were now claiming to preserve the Sphinx dating, sufficient rain actually fell to weather the Sphinx into its present condition immediately following its construction, then it would seem to follow that the same rains would have fallen in nearby Saqqara. Since even soft limestone is far more durable than mudbrick, it would seem to follow logically that these mudbrick tombs would have effectively dissolved under such conditions. But they are there to this day, plainly visible, and showing little or no signs of having been affected by water. Visiting in Abydos, Schoch confirmed that the crumbly bedrock surrounding the mysterious Oseirion was not bedrock at all, but packed Nile silt from ancient floods. These silts, at a level far above the level reached by floods during the dynastic era and up to today, must have been laid down at a time when weather conditions were much wetter than they have been in historical times. The simplest explanation would be that these floods occurred during that extended rainy period following the breakup of the last Ice Age. This in turn strongly suggested that the striking and inexplicable anomaly of a dynastic Egyptian temple, cut into a hollow in the ground, was not an anomaly at all. But rather that the temple was initially built in the very distant past, before those high level floods, and the floods then subsequently covered the temple, producing the present-day anomalous effect. While not conclusive in and of itself, the evidence at Saqqara and at Abydos fits in neatly with the accumulated evidence at Giza. Meanwhile, it became necessary to challenge the attribution of the Sphinx to Chephren from still another direction. It was an article of faith among Egyptologists that the ravaged face of the Sphinx was meant to represent the face of the Pharaoh Chephren-even though to the naked eye, there was no detectable resemblance between the two. Then, in 1989, in a National Geographic article, archaeologist Mark Lehner described his attempt to reconstruct the damaged face of the Sphinx with a computer. The reconstructed face closely resembled that of a statue of the Pharaoh Chephren. But in order to produce his reconstruction, Lehner had fed Chephren data from one of the Chephren statues into the computer, which then, predictably reproduced the face of Chephren. This was then superimposed upon the Sphinx, “proving” that the face of the Sphinx was that of Chephren. Using an identical method, it would be equally possible to “prove” that the Sphinx was really Elvis Presley. Nevertheless, Lehner’s results were widely accepted as valid and reported in the press. To challenge these results, we sought help from an expert on the reconstruction and comparison of faces, Detective Frank Domingo, senior forensic artist for the New York Police Department. Domingo traveled to Egypt, and, using standard police procedures, reproduced the face of the Sphinx and of Chephren and compared them. Domingo concluded that these two faces were dramatically different and could never have been intended to portray the same individual. Since all other evidence used to attribute the Sphinx to Chephren was circumstantial, it was clear the attribution could persist only as an article of faith. It could not be supported by science. Convinced that our own accumulated evidence was now compelling, Schoch submitted his results to the Geological Society of America and was invited to present his work at the GSA annual meeting in San Diego in October, 1991. At this convention, our evidence was examined by hundreds of geologists with various specialties within the field. None was able to fault the theory; many offered to help with the ongoing research. The GSA called a press conference, attended by science reporters from many national and international newspapers and science magazines. Impressed both by the evidence and the general approval of the geological community, the theory was given major press coverage, much of it devoted to the unusual interdisciplinary conflict that pitted geologists against Egyptologists and archaeologists. At the onset of the project, we realized that we could expect little cooperation and no funding from the disciplines whose very foundation the theory threatened. To fund the work and to let the public know about it, we had intended to produce a scientific television documentary which, if successful, might be shown on PBS or Cable Television. But the volume of press coverage and the intense world- wide interest generated by the story now convinced NBC that a much larger public audience existed than the one we had originally set out to reach. With Charlton Heston as host, and a network budget to work with, the Sphinx theory was explored in a one hour documentary, “The Mystery of the Sphinx”, first aired on prime time in November, 1993. The show was widely viewed, and the high ratings proved that a science-based show could in fact draw the kind of big audiences network television requires. The Mystery of the Sphinx won an Emmy for Best Research and was also nominated for Best Documentary Program. Subsequently, the BBC did its own version of the show, broadcast in September, 1994, again drawing high ratings and inciting widespread interest. A proposal to carry out further geological and geophysical work on the Giza Plateau and to explore, at least with fiber-optic cameras, the mysterious cavity or chamber between the paws of the Sphinx has been submitted but so far has not been approved. The standard explanation of the pyramids as tombs, and tombs only, has never been universally accepted outside of Egyptological circles. The principal alternative theories are described in the chapter devoted to the pyramids. Even within orthodox circles, there is a persistent hope that the pyramids, the Great Pyramid in particular, may still conceal hidden chambers somewhere within its gigantic bulk. In 1980, Robert Bauval, an Egyptian-born, Belgian structural engineer became interested in the astronomical enigmas presented by the pyramids and the general emphasis placed upon star-lore by the ancient Egyptians. This was not entirely virgin territory. Though most Egyptologists were content to ascribe the emphasis placed upon the sun, stars and constellations to superstitious solar or stellar cults, at least a few looked for a rationale behind what otherwise seemed a curious obsession. In a country as sunny as Egypt, a preoccupation with the sun, and a form of sun worship might seem an obvious development. But what was responsible for the extraordinary attention paid to the constellations, Orion in particular, and the star Sirius? These are cited in innumerable funerary texts. After death, the Pharaoh’s soul was said to become a star, to join with Orion in the sky (a belief that found its way quite unaccidentally into the Walt Disney animated film “The Lion King”). In the texts, Orion is commonly associated with the god Osiris and Sirius with the goddess Isis. Intuitively Bauval felt there was a connection between the positions of the constellations in the sky and the overall layout of the Egyptian pyramids. He thought it possible that the positions of the pyramids-specifically, that unique series of Fourth Dynasty pyramids at Giza and at Dahshur-formed a kind of star map on the ground. When he began his own work, Bauval was unaware that others had already explored areas within this astronomical territory. Several Egyptologists had suggested that the peculiar air channels or ventilation shafts in the Great pyramid were not air channels at all, but rather served some symbolic purpose connected with the destiny of the King. These peculiar little passageways are cut into the individual core blocks, stone by stone, on an angle. They lead from the King’s and Queen’s chambers to the exterior of the pyramid, a distance of some 200 feet (65 meters). If intended as ventilation shafts, a simple horizontal slot leading to the outside would have been more efficient and vastly simpler to build. It was also difficult to see why the deceased king would need a supply of fresh air. Pursuing the question of a symbolic meaning, Egyptologist/architect Alexander Badawy thought these channels might be designed to point at certain stars. Enlisting the expertise of astronomer Virginia Trimble, he determined that the channels of the King’s chamber were indeed focused on stellar positions prevailing around 2600 B.C. ; the northern shaft pointed to the Pole Star and the southern shaft to the stars making up the belt of Orion. Though their results were published in a German Egyptological journal in 1964, they aroused no Egyptological interest and only came to Bauval’s attention after he had been obliged to explore much of the same territory on his own. Bauval arrived at similar, though not quite identical, conclusions and slightly different dating (2450 B.C. for the construction and alignments as opposed to 2600 B.C.). It took Robert Bauval some ten years to back up his original intuition with the kind of scientific data that would stand up under rigorous scrutiny. Perhaps because he was able to frame his data within a more comprehensive overall plan, and perhaps because the times had changed, his work provoked intense and immediate attention, especially outside the confines of academic Egyptology. His book The Orion Mystery became a bestseller, and a BBC documentary of the same name was viewed by a considerable audience. The development and implementation of Bauval’s theory is technical and impossible to summarize in a few paragraphs. But the main results can be stated simply enough. Even though the shafts of the Queen’s Chamber do not extend to the exterior of the pyramid, they are nevertheless star-aligned to positions that prevailed in 2450 B.C.- the northern shaft to Orion and the southern shaft to Sirius. The date 2450 B.C. closely corresponds to the period Egyptologists propose for the building of the Great pyramid. The curious pattern formed by the three pyramids on the Giza Plateau also corresponds to the line-up of the stars forming the belt of Orion. The pyramids themselves also seemed intended to represent the actual physical appearance of the three stars making up the belt of the constellation as well. The belt features two very bright stars, lined up with each other, and a fainter third star skewed off to the left. This is how the three pyramids look. The huge structures of Cheops and Chephren lined up rigorously along the same axis, and the inexplicably smaller (but expensively granite-clad) pyramid of Mycerinus off center to the left: this, thinks Bauval, is the belt of Orion reproduced on the ground. References in the enigmatic Egyptian texts suggested to Bauval that Egypt regarded the Nile as an analog of the Milky Way. Therefore, it followed, if this was to be taken literally, that astronomical alignments of structures to stars and constellations should place them in relation to the Milky Way at a given point in time. But calculating the position of the Giza pyramids, he did not get a correlation for 2450 B.C. as expected, given the date written into the star shafts. Rather he got a date of 10,500 B.C. This was puzzling. Bauval knew from his research that the Egyptians themselves claimed their civilization extended far back into the past, beyond the era of dynastic Egypt. But he did not become aware of our geological work on the Sphinx until after his own book and video were completed and so did not speculate on the significance of that anomalous early date. He could not imagine why gigantic structures built with such precision and at such immense cost around 2450 B.C., should be calling astronomical attention to 10,500 B.C. But once he found out about our complementary inquiry, producing roughly the same date, suddenly the astronomy seemed to be validating the geology and vice versa. Now that peculiar two-stage construction we see in the Chephren pyramid fell into place. The lower courses and the blocks of its surrounding floor paving are formed of the same kind of gigantic masonry as the Sphinx and Valley temples. Applying normal art historical standards, this would date them from the same ancient epoch. It was not that the Egyptians of 2450 were inexplicably hearkening back to that earlier time; rather two very separate eras of construction were indicated. Bauval’s 10,500 B.C. astronomical pattern showed that while the present pyramids do indeed date from dynastic Egypt as Egyptologists have long insisted, they must replace, or-in the case of the Chephren pyramid-be superimposed upon earlier structures whose siting corresponded to that earlier date. Since no one has ever examined the pyramids looking for this kind of evidence, it’s impossible at this point to say if further support for the theory will be found. Bauval also derived further insights into the astronomical alignments from the work of Egyptologist Jane B. Sellers who explored Egyptian star lore in her 1992 book The Death of Gods in Ancient Egypt. In particular, Sellers called attention to an ancient astronomical preoccupation that has been receiving attention over the past few decades, but whose significance is still not understood. This is the importance attached by the ancients to the phenomenon called precession-of the stars and constellations in general and the equinoxes, and (Bauval thinks) the solstices in particular. It is the precession that gives rise to the well-known so-called Ages: the Age of Aries, the Age of Pisces and soon, the Age of Aquarius and so on around the zodiac. Astronomically, it simply means that for the duration of an Age, at the spring equinox the sun will rise against the backdrop of one constellation, gradually moving through that sign in 2160 years. One-twelfth of 25,920 years equals 2160 years. One degree within the circle of the Great Year equals 72 years. In other words, it takes one year for the equinox to move or precess one degree. Sellers determined that Egypt placed great importance upon these critical precessional numbers 72, 2160 and 25,920-as did other ancient civilizations. Multiples, factors and powers of these numbers also appear time and again. Knowledge of the precession presupposes an advanced astronomy, extending over long periods of time. It takes long, systematic observation to establish knowledge of this exceedingly slow movement. Sellers, in her book, discusses the importance ascribed by the Egyptians to the precession, which they and other pre-Greek civilizations were not supposed to know anything about. WHY was this phenomenon so important to ancient civilizations? And why was it so scrupulously Written into their legends and mythology and incorporated in subtle but demonstrable fashion into their architecture? No one can say with assurance. It may be that the ancients possessed valid knowledge that we at the close of the twentieth century do not possess. And it’s just possible that great storehouse of mysteries, the Great pyramid, may hold some of the clues. The metrologist Livio Stecchini determined that the Great pyramids had been designed as a precise scale model of the earth; the northern hemisphere projected onto its circumscribed half-octohedron, or pyramid, on a scale of 1:43,200. Since there are 86,400 seconds in a day, Stecchini concluded that the dimensions of the pyramid could only have been chosen deliberately in order to make the pyramid time-commensurable as well as a physical scale model of the earth. But WHY go to all that trouble to do either of these things? Now the precessional question enters. The number 432 turns up again and again in myth and legend around the world. It represents a double precessional age (2 x 2160) or a sixth of the Great Year of 25,920 years. Because there is a formal mathematical relationship between the numbers involved in the diurnal and the precessional cycles, choosing the scale of 1 :43,200 automatically invokes the precession as well as the day. It does not seem likely that the precessional correspondence is merely an artifact of the 1 :43,200 ratio. Bauval’s research, along with that of Sellers, De Santillana and von Dechend, Trirnble and Badawy, makes it clear that the long-term cycles of the heavens was a matter of paramount importance to ancient Egypt. In some real and physical sense, at least one function of the Great pyramid was to serve as a gigantic chronometer or time-keeping device. This of itself answers nothing. It magnifies the WHY. Why write the precession into the pyramid? Or the number of seconds in the day? All that can be said with certainty is that the Egyptians and their predecessors of 10,500 B.C. had this knowledge and enshrined it in their architecture. With that knowledge, it becomes possible to at least start asking intelligent questions of these enigmatic structures. When intelligent questions are asked, answers are often not far behind. As this is written, promising leads are showing up. In Fingerprints of the Gods, author Graham Hancock explores the voluminous evidence, both physical and textual, referring back to vanished high civilizations and a universal Deluge/cataclysm in the distant past, with a date of around 10,000 B.C. emerging out of the welter of data. Researchers Rand and Rose Flem-Ath, in When the Sky Fell, concentrate on the physical evidence for the cataclysm and its likely cause or causes. The Flem-Aths update and implement the brilliant but ignored work of Charles Hapgood, initially published in 1958 (The Earth’s Shifting Crust) with an enthusiastic foreword by Albert Einstein, no less, but ignored by the scientific and academic community. With a volume of new evidence, drawn from geology, paleoclimatology, ancient cartography, astronomy and comparative mythology to support Hapgood’s original thesis, the Flem-Aths argue that the site of Plato’s Atlantis is not the middle of the Atlantic Ocean, but rather, under the frozen wastes of Antarctica, which prior to shifting of the earth’s crust, was situated much further north. Improbable as this may sound, many well-known anomalies and enigmas are resolved through this theory: the otherwise inexplicable sudden extinction of mammoths, sabre tooth tigers, and other mammals large and small, all over the world around 10,000 B.C. ; the drastic rise in sea levels; and other solidly established dramatic earth changes taking place around that time. The Flem-Aths and Hancock speculate that the phenomenon of the precession plays some kind of central, causative, physical role in this immense tableau. This role, somehow recognized and acknowledged by the ancients, was written into their mythology, and in physical fashion into their prodigious monuments through measure and precise, tell-tale astronomical alignments. Perhaps it now behooves us, as we ourselves move from one precessional age (Pisces) to another (Aquarius), to try to reacquire that lost knowledge that was for the ancients so very important. The search for hidden chambers may yet yield fruit. The latest investigations have turned up some leads. A team of French engineers in the late 1980s found a mysterious cavity or void behind the masonry of the corridor leading to the Queen’s Chamber. There was no entrance hidden or otherwise to this space, so that it was clear it was not intended to be used. A fiber-optic camera was inserted and showed the cavity empty of treasure but half full of sand, which upon testing proved to be radioactive! These finds were disclosed at an Egyptological meeting in Kansas, but thereafter, as far as I can determine, never published. All subsequent attempts to get more detailed information from the relevant authorities have been met with evasion and/or claims that I had been misinformed in the first place. Conspiracy theorists see a cover-up in progress. Certainly a cover-up is hardly out of the question, but for the moment it must remain just one of a number of possibilities. The cavity or void is acknowledged to exist but is considered a structural anomaly of no interest or importance. More interesting, and better documented is the much-publicized exploration of the so-called air shaft (really “star shaft”) of the Queen’s Chamber. Over the course of two centuries of pyramid exploration, every known aperture, cavity and shaft of the pyramids has been systematically excavated and explored. The Great pyramid in particular has been called the “most carefully studied monument on earth.” Its passageways, chambers and it exterior have been measured time and again with increasing precision and sophistication, in part to try to prove or disprove the various pyramid theories. Only two known shafts had never been explored; the so-called air channels of the Queen’s chamber. These shafts, only eight inches square, lead from the Queen’s chamber, up through some 60 meters of masonry toward the pyramid’s exterior. But unlike the similar channels in the King’s Chamber, it was discovered that the Queen’s Chamber shafts do not extend all the way through. Either they were blocked or for some reason were never cut all the way to the exterior. Early attempts to insert a series of rods up the length of the channels were thwarted when it was discovered the shafts did not go in straight line up and in, but were kinked after an initial straight run. The rods could not be forced past the corners, foiling further exploration. The original attempt produced three small, unglamorous relics (probably parts of ancient tools) which were put away in the British Museum stores and forgotten. There, for over a century, the matter rested. Then in 1992, while working on the new ventilation system within the Great pyramid, Rudolf Gantenbrink, a German engineer and robotics expert, took an interest in these unexplored shafts. Gantrenbrink proposed building a tiny, state-of-the-art remote controlled robot capable of traversing the constricted passageway and exploring the length of the shafts. He was given permission to proceed, found private financing and in due course the robot was ready. Named UPUAT (after the ancient Egyptian Opener of the Way, a form of Anubis) the tiny robot with its cameras and onboard lighting made its slow way over a number of minor obstacles, negotiated the bends in the shaft and traversed its 200 foot length sending back detailed photographs. Roughly three-quarters of the way to the exterior of the pyramid, UPUAT’s passage was halted, not by rubble blocking an open shaft, nor by a dead end, but by a limestone block fitted with what appeared to be corroded copper handles. The apparent handles suggested to Gantenbrink, and to others, that the block was something more than just another core block, filling up the interior of the pyramid. Handles suggested that this block had been an afterthought of some sort, slid into place after the rest of the surrounding areas had been completed. Or perhaps that particular block was supposed be removable? A sliding block is a kind of a door. Except in surrealist paintings, doors normally represent transitional states; doors separate one function from another; doors lead somewhere. Gantenbrink speculated that a chamber of some sort could lie behind the sliding block. This southern shaft was directed at Orion, associated with Osiris by the ancient Egyptians. Could there be a statue of Osiris behind the sliding block? Or other sacred, religious objects associated with the principle of renewal and resurrection? Why go to all the trouble of constructing these little channels through 200 feet of masonry in the first place, only to seal them off? What, if anything, lay beyond the block? The block did not rest entirely flush on the floor below it. There was a small aperture left at one of the corners. Gantenbrink was certain he could fit UPUAT with a tiny fiber-optic camera like those used in microsurgery and get through the aperture to photograph behind the wall. A new pyramid mystery had been added to all the others. Gantenbrink’s discovery made headline news around the world. Egyptologists alone were unimpressed. Secure in their conviction that no pyramid mysteries remain, they downplayed and dismissed the mysterious door. As this is written, Gantenbrink has been unable to get permission to put his fiber optic camera behind the block.